Only three of last night’s six planned games went ahead in the Haslem Sheppard-Halifax AFL after heavy rain. The most significant of them was at Shelf Park where Illingworth St Mary’s boosted their Division Two title hopes with an 8-1 win over Shelf United Reserves. Saints closed the gap on leaders Brighouse Sports to seven points and they have three games in hand. Lee Cartwright scored a hat-trick for the visitors and Scott Hamilton, Dec Rothery, Adam Helliwell, Ashley Holms and an own goal accounted for the rest of Illingworth’s tally. Elliott Parkinson replied for Shelf. Michael Midgley continued his red hot scoring streak for Denholme United in Division One but his side’s winning run was halted by visitors AFC Crossleys. The Illingworth side won 4-3 at Foster Park, goals from Craig Gladwin (two), David Maguire and Des Morris outweighing two from Midgley and one from Jason Gill. Crossleys climbed to third while Elland Allstars moved up a place to eighth with a 2-0 home win over Stainland United, Connor Bell getting both goals. In the Premier, the Calder Valley derby between Hebden Royd Red Star and Calder ‘76 was off, as was title-chasing Stump Cross’s match away to Warley Rangers. 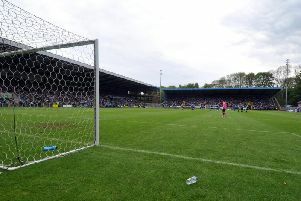 The other postponement came in Division One with Sowerby Bridge’s Walton Street pitch deemed unfit for a contest with Halifax Irish Centre.